Theatre students watch Steve Tolin - owner/operator of Tolin FX, an award-winning special effects and specialized design and fabrication studio - shoot off fake blood during a workshop at the Pittsburgh Playhouse. 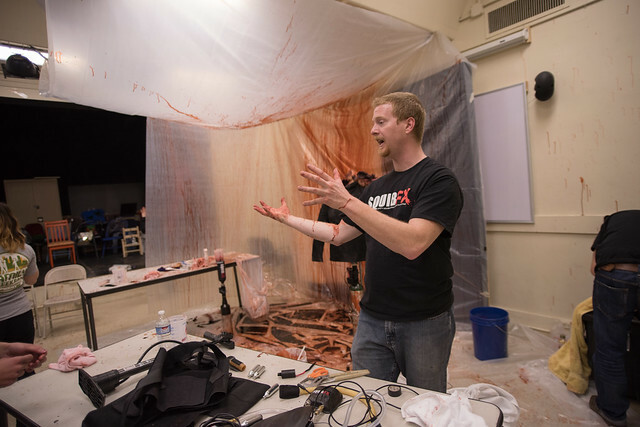 Using household items like corn syrup, chocolate fudge, food coloring and detergent, theatre production majors learned how to make fake blood and wounds at a special effects and blood workshop led by Steve Tolin - owner/operator of Tolin FX - at the Pittsburgh Playhouse. While mixing together a gallon of corn syrup and food coloring, Tolin explained to students what he enjoys most about his job. "My job is to create special props and effects. I get to plug into other people's creative endeavors at the spot where they need attention for a special challenge and it's great," Tolin said. "One of the things that is really cool about working in theatre and film is that collaborative artwork is so different than fine art." Associate professor Stephanie Mayer-Staley organized the workshop and said her students admired Tolin's "MacGyver" spirit, referring to the 1980s TV show. "My students were excited to see that Steve creates professional rigs out of a mixture of household and professional-grade items. They were impressed that he founded his company and is now working in the U.S. and abroad," said Mayer-Staley. Claire Daniels, a freshman theatre production major, said the key message she took away from the workshop was the importance of innovation. "Sometimes the solution to a problem isn't immediately apparent, but thinking outside of the box can lead you to some pretty amazing and innovative things," Daniels said. "It's always refreshing to talk to someone working in the field because you know they've been in your shoes. It's nice to see Steve is making a living doing something that I hope to do one day." Classmate Grace Taraborrelli, a freshman stage management major, described the workshop as fun, bloody and interesting. "Big thanks to Steve for taking the time out of his busy schedule to share his experience with us. Shooting off the fake blood was my favorite part of this workshop," Taraborrelli said. Added Mayer-Staley, "the next time we have this workshop, we will make sure to cover the whole room with plastic!"